A Report by Helen Limon. I look around the crowded train. Twelve carriages long, it runs direct between Gatwick airport and central London and has bewilderingly little space for luggage. In carriage C, all the seats are taken, many occupied only with coats and bags. These items’ owners stare resolutely out of the rain-dashed windows avoiding the gaze of those left standing in the aisles. I am trying and failing not to judge. 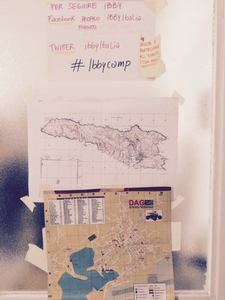 I have just flown in from an IBBY run volunteer camp on the tiny Italian island of Lampedusa. As Victoria station draws into view, I reflect on my time there and feel a strong sense that if anyone is going to save this sorry, selfish world it is librarians. You’ve probably heard of Lampedusa, not so much for its rich fishing, beautiful beaches or protected turtles, but for its location for one of the great modern tragedies of forced human displacement. Look it up on the internet or better still read The Optician of Lampedusa by Emma Jane Kirby but if you do be prepared to weep for the world. A doer not a weeper, the Italian bookseller, Deborah Soria of IBBY Italy, with the help of volunteers and well-wishers, and book people and resident families, has started a small children’s library on this remote outpost of Europe – closer to Africa than Sicily and a centuries old staging post in global trade. It holds a collection of books in many languages and what are called ‘Silent Books’ – picture books without text but with a clear invitation to narrative exploration. We, all this year’s volunteers, are interested in how the library is becoming establish on the island and how we might use these ‘Silent Books’ with the temporary residents who have landed from all over Africa to begin new lives. Not everyone who sets off in the boats arrives safely and the young migrants group together in friendship groups that take little account of their country of origin or the languages they share. It seems that if you have been companions on a fragile boat across the sea you are bonded by something stronger than words. 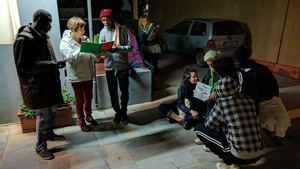 Alongside the activities in schools, and in the library, and in the allotment garden, and campaigning to get books into the waiting room of the hospital maternity unit, the volunteers are keen to help the young adult migrants, the lost boys, with their literacy. As teachers know picture books can help to illustrate grammar, vocabulary, sentence structure and all the other elements of functional literacy; but the silent book offers something more elusive and yet, we believe, just as important: the opportunity for story making, the space in which to share the emotions that we experience in common and the time to create something new, together. 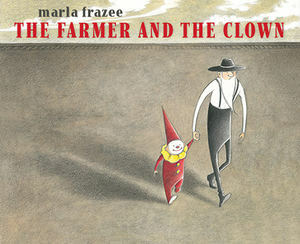 The book I chose to take out onto the dark streets last week – phones with torches, street lamps, and illuminated shop fronts suddenly take on a special importance when the school is the street – was The Farmer and The Clown by Marla Frazee. This book is a most deservedly lauded piece of art – it has won prizes and reviews. I didn’t know that when I picked it up in the library but together with five young migrants from Senegal and Gambia we found ourselves in a story about being alone, and lost and found and found again. Thank you Marla, thank you IBBY and thank you to five young men who offered their imaginations and empathy to make something very wondrous happen. Read more about IBBY Italia and the Silent Books Project. Contact ibbyitalia@gmail.com if you’d like to get involved. 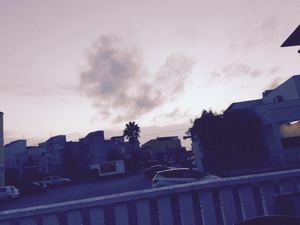 Sign the open letter to the Mayor Giuseppina Nicolini to request the completion of the library in Lampedusa.